EDITOR’S NOTE: We are very pleased to welcome Philadelphia soccer historian Steve Holroyd (the Philly soccer history pages on the Union website—that was him), whose work has long been an inspiration and great source of knowledge to us at PSP. Pat Fidelia was born in Port-au-Prince, Haiti on April 16, 1959. Moving to the United States at a young age, his family settled in Mt. Holly, New Jersey. Under the tutelage of South Jersey coaching legend Roy Frazier, Fidelia grew into a dominant offensive force on the Garden State youth scene. While attending Rancocas Valley Regional High School, Fidelia starred as a forward for the school’s soccer team, graduating in 1976 as the team’s leading scorer. He also helped Shamrock Boys Club to third place in the National Junior Cup that year. After graduation, Pat attended Mercer County College in Trenton. While there, he played on the squad that lost the 1976 NJCAA soccer final to St. Louis Community College, and was named a NJCAA All-American in 1976 and 1977. All told, he scored 43 goals in his two years at Mercer. At 5’9” and 173 pounds, Fidelia was a force in the box, gifted with exceptional speed and leaping ability. Even as a JuCo player, pro teams recognized his value—and the fact that he was now an American citizen. 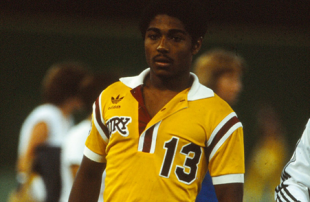 On January 23, 1978, the Houston Hurricane of the North American Soccer League used its fourth round pick (96th overall) to draft the 19-year old forward. NASL rules provided a second stage of the draft, to be held on March 13, 1978, for players who had not yet signed contracts with the team that had drafted them in January. The Philadelphia Fury were the only team to participate in all four rounds of this supplemental draft, grabbing Fidelia–who did not sign with Houston– in the third round. At the time, the Fury probably saw this as a good public relations opportunity—“Local Kid Drafted By Fury”—and little else. After all, on paper Philadelphia was loaded up front, with Chelsea legend Peter “The Wizard of Oz” Osgood heading a list that also included Irish schoolboy international Pat Byrne and number one draft pick (and fourth overall) Rich Reice from Penn State. In addition, the Fury were slated to acquire Arsenal stalwart George Armstrong to also fill a forward slot. Although the Armstrong deal was never consummated, it was nevertheless a crowded field up top, and Fidelia was not expected to contribute much. Indeed, he was not even afforded a bio in the team’s media guide that year. Fidelia’s speed and strength soon revealed him to be an ideal late match substitute, however, taking advantage of the dead legs of the opponent’s defenders. He made his debut in the Fury’s fourth match, a 2-1 victory over the Memphis Rogues on April 22 in Philadelphia. He then appeared as a substitute in the next three matches, scoring his first NASL goal in a 4-2 loss to the Caribous of Colorado. With NASL rules requiring at least two American citizens on the field at a time, it was inevitable that Fidelia would eventually get a start, especially with a woefully out-of-form Osgood having scored only one goal through the first seven games. Pat got the nod on May 13, a 4-0 drubbing at the hands of the Tampa Bay Rowdies. With that, Fidelia returned to his substitute’s role, and soon found his stride. Incredibly, on a team that included Osgood, English legend Alan Ball and long-time Irish international Johnny Giles, Fidelia came off the bench to lead the team in scoring, with 8 goals. More important, five of those goals came in the team’s last 10 games during its improbable push to the playoffs. What was even more impressive was Fidelia’s efficiency. Pat’s 8 markers in 1978 came off a grand total of 40 shots—and 909 minutes played in 25 appearances (and only seven starts). The math is simple: a goal every 114 minutes. For his efforts, Fidelia was named the Pro Rookie of the Year by New Jersey sports writers. With the departure of Osgood, and the ever-present “two Americans on the field” rule, one would have thought Fidelia would have been assured a starting job in 1979. With the Fury’s acquisition of David Robb and English Divison One leading scorer Frank Worthington, however, it was again crowded up top. The very productive offensive duo of Robb and Worthington (with 16 and 10 goals, respectively) limited Fidelia’s participation to only 17 games (and 9 starts). However, he managed to net an incredible nine goals on 33 shots and 888 minutes—including 4 against Portland Timbers in one of his starts. He also added two goals (both game winners) in the Fury’s four playoff appearances that year. 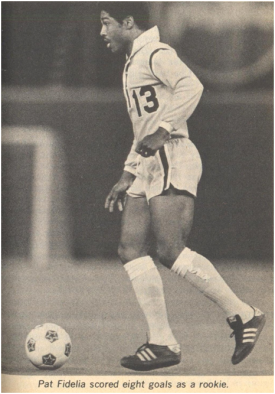 On October 7, 1979 Fidelia earned his only cap for the U.S. National Team, appearing as a sub in a 3-1 win over Bermuda. By 1980, the secret was out: The Complete Handbook of Soccer that year proclaimed that Fidelia “[is the] highest scoring substitute the NASL has ever seen.” He was also listed as the fifth best American in the league (behind notables such as Ricky Davis and Alan Mayer), as well as the fifth most underrated. League rules also required a third American to be on the field at all times that season, and Fidelia started the Fury’s first two games that year. However, he was lost for the season with a serious injury, and his great run in Philadelphia ended with a whimper. Fidelia accompanied the franchise on its move to Montreal for the 1981 season, along with other Philadelphia favorites Bob Rigby and Bobby Smith. In six games with Le Manic Fidelia managed no goals, and he was released by the club after the season. Fidelia returned to Philadelphia to play six games with the Philadelphia Fever of the Major Indoor Soccer League in 1981-82, but did not score any goals. 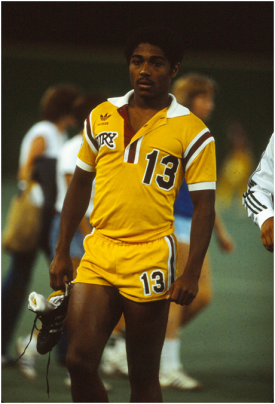 With his NASL career over, Fidelia signed with the Carolina Lightnin’ of the second division American Soccer League for the 1982 season. Recovering some of his scoring touch, Fidelia netted 8 goals for the Rodney Marsh-coached side that year. Fidelia returned to Carolina in 1983, and after the ASL folded joined the Charlotte Gold of the United Soccer League in 1984. His professional career over, Fidelia continued to make appearances for sides in the Charlotte Amateur Soccer League, appearing with the Pepsi team as late as 1990. He currently coaches high school soccer with Carolina Day in Ashville, North Carolina. Thanks for the comment, looking for old photos and vidoes of my father, never knew there was a “fidelia time” hahaha, I love it! I met Pat at the NASL Reunion in 2005. He’s a great guy. Thanks for writing this.